Today's blog post deals with setting up a Stratocaster tremolo unit only. Everything else related to setting up the saddles, etc., can be found in the "How to set up an electric guitar" post here: http://diystrat.blogspot.com/2011/03/how-to-set-up-electric-guitar.html. If you’re going to adjust both the tremolo and the saddles, then do the tremolo setup (this post) first. It’s really quite a simple mechanism, engineering-wise. 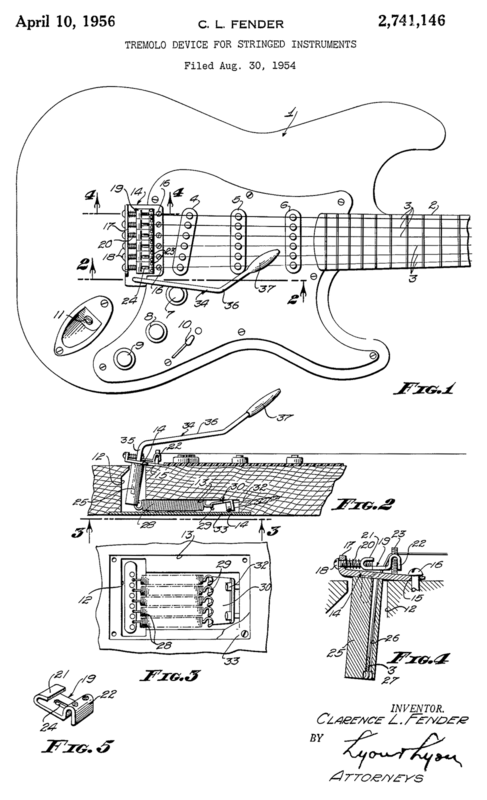 Looking at it from the side (FIG.2) we can see that it pivots on the screws that hold it to the top of the guitar body (the screws are marked "16" in the patent drawings). The tension from the guitar strings pulls the unit forward, but this tension is counter-balanced by the springs hidden below the unit (found under the cover at the back of the guitar), hence “floating” the tremolo unit. This is where you, the player, come in. To lower the pitch of the note(s) being played, push the tremolo arm towards the guitar body, thus adding to the string tension. Alternatively, pull the tremolo arm away from the guitar body to add to the spring tension and increase the pitch. For such a simple mechanism, it really shouldn’t be difficult to set up. Unfortunately, there are many reasons why these are famous last words. One of the problems is that not everyone uses a tremolo in the same way. Some people like to both decrease AND increase the pitch, whereas others prefer to just lower it. Some want the tremolo to move really easily, while others prefer it to be quite stiff, so that it doesn’t move unintentionally (either from leaning on it accidentally, or even from the increased string tension caused by bending strings). Another problem is that not everyone uses the same string gauge, so a tremolo unit that might be perfectly set up for light-gauge strings will probably not be set up well for medium or heavy gauge strings. Lastly, the starting position of the tremolo unit is a bit of a personal choice. Some people (usually the ones that only want to lower the pitch, or even not use the tremolo at all) prefer to have the tremolo unit sitting flush against the body of the guitar, while others prefer a gap, leaving enough room to pull pack on the tremolo arm, increasing the pitch of the note(s) being played. Taking all of the above into account, this post will take you through a typical setup for an average player who likes to both raise and lower the pitch and uses fairly standard strings. You can, of course, feel free to adjust this setup to your liking. One thing to mention here is that there are two common Strat tremolo types. One uses six small screws to attach the tremolo to the top of the guitar body, while the other style uses two bigger screws. Simply unscrew the arm in an anti-clockwise (counter clockwise) direction until it comes out. Be careful not to let it fall onto the surface of your guitar and scratch it. Place your guitar face down on a nice soft surface, unscrew the screws holding the back cover on, and remove the cover. Note: If you have a two-screw tremolo, once you remove the springs from the back of the guitar, there is NOTHING holding your tremolo unit in place. Be careful not to let it fall out or otherwise damage either the tremolo unit or the guitar. Place your guitar face down and carefully remove the springs. You may have anywhere from two to five springs in there, depending on how it was previously set up. There are various different methods for removing these, but with the strings removed from the front of the guitar, you will probably be able to remove the springs by hand. Just grab them near the claw end, push the spring towards the claw, and lift out. If you’re finding this a bit hard, feel free to loosen the screws holding the claw in place a little. That should give you enough slack to get them off, and will make them easier to get back on later. Alternative methods involve screwdrivers, pliers or special hooks. If you decide to use any of these tools instead of your hand, do be careful not to slip and scratch your guitar. Note: If you like (I recommend this), you can take this opportunity to remove both pivot screws and add a little Vaseline to the threads before reinstalling them. Add a little Vaseline to the points where the tremolo unit pivots on these screws too while you have this opportunity. The Vaseline adds a little bit of lubrication, helping things to move more smoothly, and also helps to minimise strange pinging noises when you move the tremolo. Have a look from the side of your guitar to see how the tremolo unit is sitting against your guitar top. It will hopefully be sitting flush, but if not, adjust each of the pivot screws until it does. Remember that there is currently nothing holding your tremolo in place at this point, so you may have to push it forward with your hand. Alternatively, leave ONE SPRING in the centre position to hold the tremolo unit in place. Unlike the six screw tremolo, the two-screw model is pretty much idiot proof and you can often just screw both pivot screws all the way in without raising the tremolo unit off the surface of the guitar. Have a look from the side of your guitar to see how the tremolo unit is sitting against your guitar top. It will hopefully be sitting flush, but if not, slacken each of the pivot screws until it does. Now slacken all the screws one turn more. Finally, tighten down the outer two screws only until they are just touching the top of the tremolo unit. The unit will now balance on these two screws, while the other four will be used solely to keep the unit in place. Time to re-attach the springs at the back of the guitar. Use the same method as when you removed them, but add a little bit of Vaseline to the two ends of each spring first to lubricate the contact points just a bit. In general, three springs located in the centre and the two outer locations is the most common configuration for standard string gauges. 1. Not all springs are the same, so if you find that you only have two springs and want to increase to three by just buying a single new one, you could end up with mismatched ones. Better to buy three new ones. 2. If you are using three springs and are tempted to place the outer two springs at an angle so that they are not parallel to the centre spring, but rather taper towards it or away from it, this will end up giving you unevenly-matched springs, as the centre one will be shorter than the other two. Generally, I would say not to do this, but plenty of people are happy with this configuration and don't seem to have any problems. You're certainly not going to break your guitar by trying it, so feel free to give it a go. 3. More springs will give you a stiffer feel. If that’s what you want, then by all means feel free to try it out. Similarly, fewer springs will give you a bouncier feel. 4. Heavy strings might require more springs and lighter strings might only need two. We’re going to need the tremolo arm for the next step, so it’s a good idea to screw it back in now. This is quite possibly the most important step of the whole tremolo setup. The claw is the fine tuner that will leave your tremolo unit sitting in just the right place for optimal balance. Before adjusting it, make sure you tune your guitar to pitch. Use the tremolo a bit while you’re at it to make sure everything is loosened up, and keep doing this until the guitar stays in tune even after tremolo use. Now look at the side of the tremolo unit and measure how far off the surface of the guitar it is sitting at. Fender recommends that it sits at about 3.2 mm (1/8"). If it is sitting too high, then tighten the two screws holding the claw in place. Alternatively, if it is sitting too low, then loosen the screws a little. Each time you adjust the screws, you will need to re-check the guitar tuning and use the tremolo a bit, then re-measure the height. Once it consistently sits at 3.2 mm and the guitar is in tune, you’re done. Be prepared to take some time doing (and repeating) this step. Like it says, put the back cover back on and replace the screws. Well that’s the tremolo unit set up and balanced nicely. For other setup tips, feel free to go to the setup post mentioned at the beginning of this one. Otherwise, feel free to ask any questions in the comments below. If i want my tremolo flush and dont plan on using it do I tighten all 6 screws in on the top? Hi Parker.I'd recommending adjusting each one so that it just touches the top of the tremolo unit, without forcing the back of the unit to start rising off the top of the guitar. Certainly don't tighten each one down all the way. Great stuff, and clear, Thank You. i use 11 52 gauge strings. my trem is sitting like the opposite of what you show in the setup lol. the end where you have the ruler in the picture is flat, and the other end where the pivot screws are is up about 3.3 mm. i hardly ever use the trem, but if i tighten the piv screws all the way down to where both ends are flush, the action is so low that the strings touch the top of the fretboard, completely un playable. also should i have my saddles adjusted for shorter or longer length with these larger strings? they are way way shorter than yours in the pictures. pleeze help im new to trems lol. Ordinarily I'd say to lower the pivot screws and slacken the springs a bit so that you have the setup like in this blog post. If the strings are now too low, then raise the height of the saddles. You can read the "How to set up an electric guitar" post linked to at the beginning of this blog post for more information on doing that (there's also detailed info there about moving the saddles forwards or backwards - I wouldn't worry if yours don't look the same as mine, as that varies a lot from one guitar to the next). However, I think in this case it would help if I could see some good close-up pictures of your current setup. Can you post a link to some pictures? My strat has 5 springs in it. I'd like to loosen up the tremolo a bit. Can I just remove two of the springs? Or, should I go buy a new 'matched' set of three? Well it's hard to know if they were all from the same set unless you bought the guitar new, but nevertheless I'd just remove two springs, especially if they all look the same (or you can see three that look the same). It's not like you're going to damage the guitar, but if you suddenly hear new buzzing, you might want to try changing which of the five springs you use. okay, so everytime I change strings the bridge is WAY higher than 1/8 of an inch and idk how to fix it. suggestions? Very good account, and answered my question of whether I needed to detune before tightening the claw screws (I can leave it in tune). A note: I did this yesterday, but today the bridge has gone up above that 1/8 inch mark. I think the springs loosened a bit overnight. I think I need to tighten it up again, and I might need to add a fourth spring. I use 11's, which are heavier than the .009's the new Strat came with. Thanks for the comment. Yeah, I'd definitely recommend at least four springs for 11s. As for the claw, it can definitely be done tuned up, but if you're having any issues, it might sometimes be easier to screw it in (maybe even more than necessary) with the guitar detuned (loosening it back out once tuned up will be a lot easier than tightening it). Please come back and let us know if adding additional springs stabilises the tremolo height. Nice write up. Tinkered with a few guits over the years but never one with a Strat trem. Did a setup on a Danocaster at the weekend using this for reference. Went with "dive only" and put the trem flush on the body plus an extra turn of the claw screws for good measure. Used high temp grease instead of vaseline and used graphite (pencil dust) to lube the nut. 6 pivot screw tremolo type here. The problem I was having is a tremolo shifting up and down on the screw where the whammy bar is. In resting position the tremolo piece was floating not parallel to the guitar body, then when I used the whammy bar, the whole piece would slide up the screw. I don't know if this is normal. It seemed to me that it wasn't. So I pushed on the whammy bar to have the tremolo piece sit against the body and I screwed in those screws until they reached the metal to see what happened. This stopped the tremolo from moving up and down that screw and now the tremolo looks parallel with the body. It floats and moves smoothly. I wish it was lower, but maybe for that I will need to adjust the truss rod a bit. I don't know if that will help however, and I can probably deal with the way it is now. One thing I can't stand is buzzing on the strings. The height from the 8th fret to the Low E string is now about 2/16ths of an inch. The fender manual says it should be .010" after adjusting the truss rod. The measurement I have there is clearly way too high. Anyways, it'd be nice to not have to deal with this stuff ever and just be able to play from day one. All this setup business is costly (I had taken it to two technicians already and they obviously did a poor job) My Strat has cost me now about $200 more than I paid for originally. I just got a brand new 2013 Stratocaster Deluxe and I tried to screw in the tremelo bar but there doesn't seem to be any threaded receptacle for it in the bar. Am I missing something. I looked down the hole and it is smooth. I see a screw that can be driven in with a hex tool. Is that really how they expect to install a tremelo bar? Is it possible you have accidentally been given a threaded arm and a non-threaded tremolo? What a great tutorial! Have 10-52s resting at home right now, screws backed way out, way more than 1/8" showing, going home to adjust . .. Took two springs off; can you use four, or would it make the pull uneven? I think you should be OK with 4 springs. It might be a little stiffer than using 3, but that might be what you want. As for pulling uneven, I have heard of some guys adjusting the claw so that it's farther in at one end to compensate for this. Not something I've ever needed to do, but you might want to play about with it if you do feel that a straight claw angle feels uneven to you. Let me know how you get on and what ends up working best for you. I've got a question about adding springs. When you say that "it" might be a little stiffer, are you talking about the tremolo operation or the feel of the strings. I have a two point and have the front side of the two point about 1/16 above the body and the rear at about 3/16. I use 10's with 3 springs. I like to bend strings and wanted to possibly add a 4th spring but don't want to add too much tension on the strings to tear up my fingers....any ideas? sorry, wanted to make some clarifications to my questions above. Is it ok for the front of the base plate on the two point system to be about 1/16 high or do I need to tighten it down and adjust my saddle heights? My reasoning for adding a 4th spring was to prevent tuning issues due to string bending but I certainly don't want to make string bends painful due to string tension. Hey, sorry for the delayed reply. I was specifically referring to the stiffness of the tremolo itself, but you may or may not notice a difference in the strings themselves, since there is a bit less "give". Honestly, though, I'd recommend you just try it and see how you feel. As for the stud height, well this is exactly how certain other tremolos are set up (some Wilkinson models, for example). Basically, they recommend setting up the saddles to the right radius, and then you can move the studs up and down to change the height, which is obviously a lot easier once the initial radius is set up. I can't imagine a 1/16" stud height giving you any problems, to be honest. I've just purchased a standard strat and wanted to set the tremolo to be flush with the body, i.e. a fixed tremolo - only allowing low bend using the tremolo arm. I loosened all the strings so that the tremolo sat flat against the body, but have noticed that the mechanism in the back of the guitar is not parallel the claw screws are lop sided. I've tried screwing the claw screws in the same amount to make it parallel, but the bottom part (high E) of the tremolo is sitting marginally higher than the top part (low E) when you look along the guitar from bridge to nut. 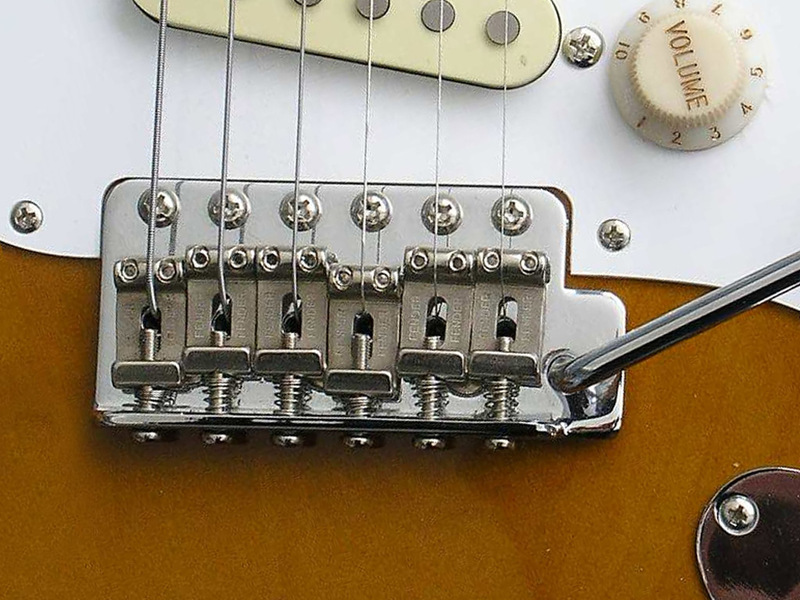 I've read that these should be tightened/loosened together to ensure they're straight, but if the tremolo isn't sitting level should these be tightened to compensate? i.e. tightening the lower claw screw making it no longer level? With this affect tuning and potentially worse things, i.e. warping etc? Hi Greg. I think I know what you're describing, but could you possibly link to a photo or two to clarify? If it's what I think, then I don't think you should feel bad about adjusting the claw at a slight angle if that's what you need to do. Sometimes the spring tension isn't quite the same between the springs, or other times there's just a bit of a difference due to the claw not being perfectly centered, etc. In these cases, an angled claw could well be the solution. this is looking down the guitar from the bridge towards the head stock and I think the right hand side looks slightly higher than the left. this is in the back compartment where you can see the bottom claw screw is already tighter than the top. So an angled claw won't be as bad as suggested? Do you think this will bring the tremolo level? Hey Greg, firstly it really doesn't look that bad to me. I wouldn't be particularly concerned about either that bridge angle or the claw angle. I've seen much worse. Secondly, the spring tensions (and therefore the claw angle) shouldn't really come into play here (though I could see how some twisting might go on). I'd be checking the front of your bridge first to see if it's level. If it is, then there's a chance the bridge itself is slightly warped, and quite honestly I wouldn't be overly concerned about this. However, adjusting the stud height at one side of the front of the bridge should be more directly connected to how the bridge sits (including at the back). I'm assuming it's a two-stud tremolo. Please correct me if I'm wrong. a)Fender says 3/8" measured from where to where? Sounds huge. Does anybody really do this? b)In the photo, the scale appears to be in 1/20 inch? It says 0.5mm but there are 24.4mm in an inch. Where and how is it measuring? Top of the bridge plate from the body surface? Good questions, Anonymous. For where to measure, I'm going from the underside of the plate, near the back just before it starts suddenly curving up. My understanding is that Fender recommends 1/8", not 3/8". That ruler is metric along one edge, and along the other a Chinese measurement called "cun" that looks like inches, but each unit is in fact approximately one tenth of a foot (or 3 cm). More info here: http://en.wikipedia.org/wiki/Cun_%28length%29 . I've made mention of it on some other posts, but not on this one. Sorry for any confusion. Hi, I'm poor, so I got a Chinese Strat. I'm having a hard time getting it in tune. It seems I have to move the saddles all the way back to the bridge plate, and then the saddle springs get in the way. Is it advisable to remove the saddle springs? Why are they really needed anyway? Or should I look for smaller saddles? Right now the guitar has the large rectangular saddles like you have in the picture. Also, what do you recommend for string height at the saddle end? Thanks. Hi JS, I've actually had to do that on a couple of Strats in the past with the low E string. I wouldn't worry too much about removing a spring or two (although I'd advise you to store them safely somewhere just in case you need them later). 1. Since there is no spring to push the saddle forward, you'll need to make sure it's in the right position when you string it up. 2. If you tighten the saddle ALL the way to the back, it will hit the back edge of the tremolo base plate and this may make it rise up in the air a little (i.e. the saddle height adjustment screws will be overridden, so to speak). Make sure that's not happening. I have problem with my fender deluxe 2points synchronized tremolo. When the tremolo move to guitar body (to the right side), he can not return to the starting position. The guitar does not stay in the pitch. To the guitar back in the pitch is necessary to move the tremolo in the opposite direction. I tried to balance the tension of the springs to the tension of the strings, but i failed.... Do you know how to solve this problem? Thanks! 1. Check that the sides of the tremolo springs aren't rubbing against the guitar body itself. If they are, maybe try putting them into a /|\ configuration and readjusting the claw if necessary after that. 2. Check that your strings aren't getting stuck in the nut. A good way to determine this is to tune the strings down and then up and see if you hear any pinging noises. If so, then the nut slots are too tight and should be widened slightly, or you should apply something like nut lube. 3. Check the studs and the front edge of the tremolo base plate to make sure there is no deterioration there. The tremolo doesn't "pivot on the screws", as stated here. The fulcrum is the beveled front edge of the base plate. Hi Anonymous. You are, of course, completely correct in saying that the front edge of the tremolo base is the fulcrum. What I was trying to say was that the screws are the point at which that fulcrum pivots. Excuse me, but aren't the screws marked 16 and the plate 15? Thanks LuckyLicks. You're right. Fixed now. I have exactly the same strat bridge as the one displayed in the first pic of your tremolo setup tutorial - Ibthinl it's called 'amrican series'..
and I was wondering whether you could tell me what size of allen or hex key I should use to modify the saddle height? I've looked all over the web, found some info that it should be 0.050" or 1.27mm, but this does not fit, too big.. I just finished balancing the tremolo on my 6 screw American Special Strat using your instructions. It seems to be holding tune nicely now with good action on the trem. I am getting 2 to 3 half steps at full articulation. Thanks for the excellent articles. If I had to find a gripe about Fender it would be the difficulty of finding clear instructions for a particular model of guitar. Hi Raymond, thanks for the feedback. It's nice to hear when these instructions were useful. Pymx, sorry, I just spotted your question. Let me try to find out and get back to you. Hi Pymx, I'm also getting 0.050". One trick I've used in the past is to use a Torx wrench instead. I believe a T5 one might see you right (apologies if I'm a size out). If you can hold on for a day or two, I'll try a couple of tools out with the tremolo in question. Turns out I don't have the correct allen key and so I've been using a Torx driver exclusively. The one I use is marked "A3", but I can't see any reference to that online, and I'm pretty sure it's not the same as T3. Best advice I can give you is to get a set of (small) Torx drivers and just try a few different ones. I'm hoping to pick up a set of small imperial allen keys at the weekend and try them out. If I manage to do that, I'll let you know which size fits. I just grabbed a set of imperial allen keys. The 0.050" one is correct. Hi - Very helpful post. I have one question though. When people talk about a floating bridge do they mean like the one in your picture where the front of the bridge is flat (or almost flat) to the body and angling higher towards the back? Or is a floating bridge supposed to be sitting off the body and parallel to it? Hi Neil. Floating just means that you will be able to move the tremolo in either direction, so the way I have it set up, or, as you described, with the front also a little bit off the body. As long as you're able to move the tremolo in both directions, then it's considered floating. Hello. I have a 2011 American Deluxe Strat and the tremolo is very stiff, meaning I have to press it down pretty hard to lower the pitch. It has 3 springs. If I simply loosen the 2 screws attaching the claw to the body will this loosen up the tremolo a bit? Hi apophatic, that's one possibility. How far off the body is the back of the tremolo currently sitting? Thanks for responding. The bridge and tremolo are flush against the body of the guitar, so I can't raise the tremolo at all. The two claw screws are pretty far into the body, so there's plenty of room to loosen them. I'm guessing if I do, it will also raise the action, right? OK, definitely sounds like you need to loosen the claw screws then. You need to loosen them until the back of the bridge (before it starts curving up) sits at about 3.2 mm (1/8") off the body (although this is somewhat personal choice). The action would be raised a little bit, but not much. Of course you could adjust the saddles after that (covered here: http://diystrat.blogspot.com/2011/03/how-to-set-up-electric-guitar.html). 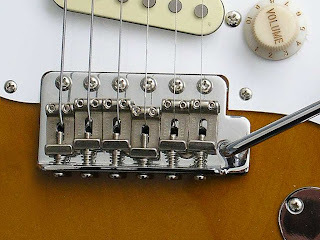 Another option if you want to keep the tremolo flush with the body, but still want it to be a bit easier to use is to loosen the claw just until you notice the bridge starting to lift off the body and stop there. Of course you'd only be able to lower the pitch when you use the tremolo, but some people are OK with that. Hello, just browsing through the internet for solutions. and came upon this amazing blog!. i have aquestions regarding my strat. i recently bought and upgraded the strings on it to the DR pure blues 12-52 extra heavies. i have the same ones on my ES-335. but, needless to say that's a different trem. the situation i'm dealing with is, i replaced the strings and my trem claw is raised pretty high. i tried screwing in the scraws inside the cavity to lower it flush to the body, but even though i practically screwed them all the way in; it made no difference on lowering it. i messed around with the neck to see if i can bow it a bit forward to loosen the stiffness of the added tension, but that did nothing either. so eager to play it, i ended up placeing some thing in between the tremolo piece inside the cavity against the inner wall of the body and that lower the bridge flush. what can i do to fix it properly? thanks! Hi sw. There are a few workarounds for this. One of the easiest is to wrap a small amount of plumber's tape around the threads of the tremolo arm. In case you're not sure what plumber's tape is, it's PTFE tape with no sticky side. It just kinda grabs ahold of itself as you wrap it around (http://411plumb.com/what-is-plumbers-tape/). There are other solutions, such as putting a spring inside the cavity, but I find that the plumber's tape trick works best. Great post! Visit our blog to know our views on music and guitars. I have a brand new genuine Fender replacement body pre-drilled for a vintage 6 hole bridge. I have a genuine Fender vintage bridge, Neck is from a Fender Classic player Strat so is a C-shape with 12" radius. Everything went together just fine but when I strung the guitar I noticed the strings were touching the fret board. I have had to raise the saddles so high the screws are nearly out and the action is still quite low although playable. Also, the bridge is sticking up far too much at the back, its about 3/8" above the body and the claw screws are nearly screwed right in. What the hell is going on? Have I got the wrong neck for a vintage bridge? Should I be using a lighter guage string, I am currently using 11's? Hope someone can help. The second issue is the trem sitting high even when the claw is screwed in all the way. The answer to this is to add another spring or two. Take your guitar to a guitar shop to be set up.It costs you but saves hours of messing around when you could be playing. Someone once said "a little knowledge is a dangerous thing". Let a pro do it properly!!!! My brother is a huge jeff beck fan, and is trying to set his tremelo system like his. any tips for him on how to do so? Hiya. I have been told in no uncertain terms that one should NEVER adjust the pivot screws. The trem angle should be adjusted with the claw screw behind the springs ONLY. Mesing with the pivot screws results in misalignement of the pivot point. If you want you trem plate flush to to body, tighten the claw in increments (retuning each time) until you get end of the plate nearest the strap button just touching the body. If you wish to have a more "floating" setup then do them same but unscrew the claw in increments (again retuning each time. When you have the tremelo at the angle you prefer, readjust string height and intonation and re-check the trem angle. Repeat all steps until equilibrium is achieved. I say again - dont adjust your pivot screws. Thanks for the clear and concise directions. The 94 Strat I just picked up had the claw screwed all the away in to allow for lowering the pitch only. Following your directions I was able to set it up perfectly at my first attempt. Thanks! Hi -I've got three springs, and am having problems with notes going flat when I bend (bending one string whilst also playing a second un-bent note). Currently blocked the tremolo by putting a small piece of wood behind the block so that the tremolo doesn't move, and taking out the redundant arm. This solves the problem, but of course I can't use the tremolo. Do I need to have more springs, or is it simply a case of tightening the claw screws? Also if you are doing double stop bends and you have a problem with the "stationary notes going out of tune when you bend a string, you can add more springs to keep it more in tune. Your low E will never stay in tune when you bend other notes, but you can get pretty good tuning stability on the D,B and high e strings while bending the G up a whole step if you use 5 springs. This isn't mentioned anywhere so I thought I would throw that in. Also you can slightly increase or decrease your travel for pitch by raising or lowering the bridge screws slightly, but it will also raise and lower your action slightly, and probably effect your tone. You are essentially lifting the bridge off the body very slightly to increase travel. Or screwing it down a little more to improve tone and decrease travel. There is something about adjusting the claw I don't understand and doesn't seem mentioned anywhere. When there is an even gap between the claw and the body, then the gap between the bridge and the body is not even. The bridge near the first string, high e string, is closer to the body then near the 6th string. To get an even gap between the bridge an the body I have to screw the claw in more on one side and it's very crooked. I have three springs - one in the center and one each on the outsides. .010 strings. If it is just from different tension in the strings I would think everyone would experience this. What's happening? Hi, my trem springs are sitting high hitting cover plate, shall i drill new holes for screws that hold springs or is there another option? Hello! I have a problem with my floating two-point tremolo. When the tremolo moves down (dive) does not return to the start position – the bridge stays a little down and the pitch goes down. AND when the tremolo moves up again the bridge not return to the start position and it stays a little higher (the pitch is sharper). hi,i just seen this and it's great to have that help here. i have a strat with three springs and 10 gauges. i mostry don't use tremolo but, if it can be done, i would want to have the chance to use it. my problem is that I'm playing a lot with standard and drop d tuning so every time i change tuning (witch is often) the other strings (except E witch i tune down or up) are lowering or lifting pitch due to the tremolo and i have to retune every one of them again. how can i adjust the system so it won't happen? i sacrifice if needed not to use tremolo but if i can it would be better. Really helpful - thank you for putting this excellent resource together.